With a hot climate, easy access to gushing whitewater rivers, canyons and whitewashed colonial towns, Colombia’s northeastern Santander department offers a range of activities for the outdoor enthusiast. 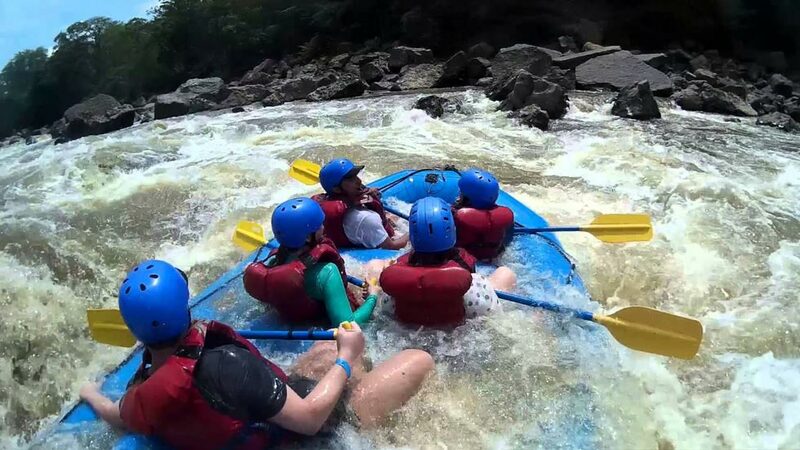 To paraphrase a young Norwegian traveller in San Gil “I thought it would be scary, but it was oh so cool” on shooting the Grade 5 rapids on the Suarez river, an adventurous day trip offered by Colombia Rafting, San Gil’s longest established whitewater company. Colombia Rafting is the only dedicated river sports company in San Gil, specializing in this area since 2003. The guides are well experienced and can offer several trips on the rivers here. The excursions which take place on either the Fonce or Suarez river offer adventurers differing levels of difficulty, making use of rafts, kayaks or hydrospeed — a form of river bodyboarding. Suarez is known to deliver Grade 5 rapids when it is flowing hard, in comparison; Fonce has rapids from Grade 1-3. Above the churning froth of the Suarez, the town of Barichara, 20km from San Gil stands sentinel, offering an alternative peaceful excursion. A large sandstone church and smaller chapel of Santa Barbara rise from the array of whitewashed buildings, which catch the warm glow of the late afternoon light and radiate a deep orange. Retaining an almost totally colonial architecture throughout, new buildings are generally made in the traditional style with stone and adobe walls. Bariachara is situated on a ridge with views from the Mirador to villages across the canyon. The indigenous village of Guane is an hour and half walk from Barichara by the “Camino Real,” the old stone road laid by Guane indigenous people centuries before the Spaniards arrived. Guane is a production center for many crafts including handwoven rugs and bags from fique and cotton. To see the countryside on two wheels, Colombian Bike Junkies seem to be the boys in town, offering day trips on top of the range Kona cycles with fully supportive Land Rover back up, and American hamburgers and burritos for lunch, courtesy of “Gringo Mike’s” the owner of Bike Junkies, who also has a restaurant of that name in town. The Junkies’ website take the explorer on downhill runs through canyons and coffee plantations to cool pools where riders can refresh themselves after riding in the baking temperatures of Santander. Other activities on offer in the countryside surrounding San Gil include paragliding, caving and rappelling. Rappelling can be done on the Juan Curi cascades 40 minutes from town. The cascades are worthy of a visit even if not to be rappelled down, as they take the walker through jungle to an incredible pool and view point of the water falling from above. There is scope for numerous outdoor activities in San Gil, or even taking classes in Spanish, French or English with bilingual French resident Marie’s team at Connect4 language school. One thing is for sure, you will not be bored and probably stay longer than you planned. Approximately 200 miles from Bogota, 6.5 hours by bus. There are numerous hostel and hotel options in town. Sam’s VIP Hostel seems to be the main attraction for foreign backpackers with its firm setting overlooking the main square in San Gil. Author Simon Phillips is the owner of travel blog Elusiveworld.